TNW Conference 2018 went by in a flash. As we cut off our now-manky wristbands and start getting tagged in embarrassing photos from the afterparty, let’s instead reminisce about all the incredible content witnessed at the first ever Growth Quarters stage hosted by TQ and Google for Entrepreneurs. “Think in cupcakes, not wedding cakes,” explained Des in regards to your strategy. 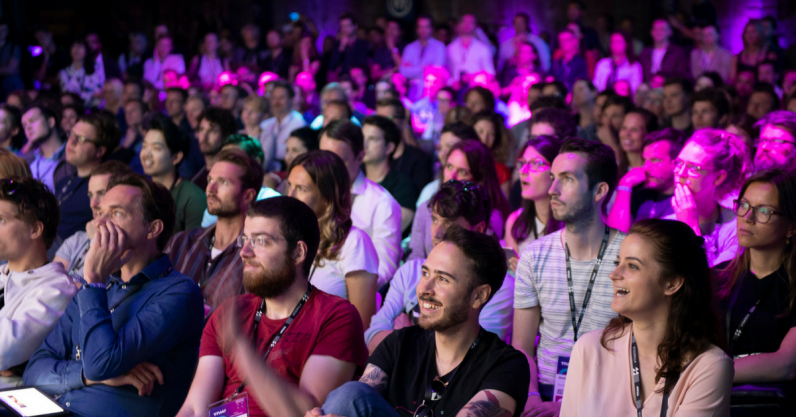 As Boris was juggling on the main stage, none other than Intercom’s Des Traynor opened our stage and his focus was product strategy. Åsa Nyström, Director of Customer Advocacy at Buffer breaking down salary transparency. “Transparency breeds trust & trust is the foundation for great teamwork,” explained Åsa Nyström, Director of Customer Advocacy at Buffer. That’s why Buffer publishes all their employee’s salaries publicly in this spreadsheet! We caught up with Åsa before the conference to find out what being fully transparent in terms of salaries really means — especially when things go wrong. Sophie (left), Renato (middle), and Simon (right) discussing how accessibility is not a barrier to innovation. The charismatic Frenchman and CEO of dating app Happn, Didier Rappaport. Axel, the former Global Head of Markets at Spotify knows a lot when it comes to the whens, whys, and hows of international expansion. Nicole Mills from Booking.com explaining the process of scaling an agile culture. “I don’t have a magic life hack, but I do have some tips and tricks to boost your productivity. This is what we teach at Google,” explained Connor Swenson from Google for Entrepreneurs. Do you struggle with productivity? Are you looking for that one trick that will change your life forever? Too bad, there isn’t one, explained Connor. It’s about building better habits, day by day. He then led the audience through a quick introduction to meditation — something they do at Google before and after meetings. Director of STATION F, Roxanne Varza interviewing Stripe’s John Collison. Who better to share insights about growing a company than John Collison, co-founder of TQ resident Stripe, now valued at over $9 billion.